Australian brewery Four Pines is on the forefront of history helping develop the first beer designed for space. An everyday Australian may also be the first to test the beer in the sky as part of a competition. For a number of years, Four Pines and space engineering company, Saber Astronautics have been developing a beer designed to be consumed in space through their joint venture, Vostok. To date, Vostok has tested if it is safe for people to drink alcohol in space (it is says Vostok) and have figured out that beer still tastes good outside of this world. Vostok is now in the final stages of developing a beer bottle for space as up until now, astronauts have had to drink liquids out of tubes because of the differences in gravity. Once development of the bottle is complete, Vostok says the bottle will be a world first. The company now wants to test its beer on a zero gravity flight which replicates the weightlessness and conditions experienced in space. As part of the test, Vostok is running a competition asking UK, US and Australian citizens to submit a 50-word essay and a pledge to buy a bottle of space beer. All entries will go into the running to join the flight. Those interested in the competition can visit the Vostok website for more details. Joaron Mitchell, Founder of Four Pines, believes commercial space travel will be a reality before the end of decade and that space travelers will want food and drink on space trips. 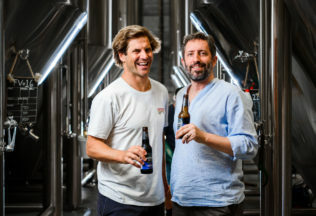 “There would be very few of us that don’t enjoy having a beer when you’re travelling and if you have the opportunity to travel to space and have forked out a good amount of dollars to do it, then I’d be wanting a beer,” Mitchell said. “We’ve anticipated that demand and are on track to meet it. It’s extraordinary to reflect on what we’ve achieved since 2010.